Honing and sharpening tools from Cutting Edge Technology L.L.C. Cutting Edge Technology™, using aluminum oxide and ceramics, has just made life easier for the winning professional team! Advances in technology have resulted in superb, high strength, custom designed, aluminum oxide instrument sharpening stones of the highest grit (the greatest number of particles per square inch) and the greatest density to give the sharpest cutting edge possible! Our CET stones are engineered to have channels that consistently and accurately reshape and resharpen both American and European manufactured curettes. Information and ordering sharpening kits found here. 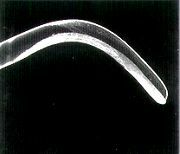 Cutting edge of a brand new curette as delivered by the manufacturer, seen under the electron scanning microscope. 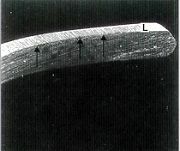 Arrows indicate severe metallic deformities and wire edges extending from the facial (F) and lateral (L) surfaces of the cutting edge itself. Roll your mouse over these images to show views of a badly worn curette after resharpening with our patented Honing ChannelTM System. Arrows indicate an exact meeting of the facial (F) and lateral (L) surfaces, and no wire edges at the cutting edge. A new patented technology was recently evaluated in a research study published in the July 2003, Volume 74, Number 7 issue of the Journal of Periodontology. The research publication clearly states the importance of this new finishing technology for dental curettes and scalers and ultimately in the care provided to patients worldwide. Previously, research reports compared unfinished cutting edges on manufactured curettes to ultrasonic instrumentation and other forms of root finishing technologies. These research studies revealed no significant differences in the quality of the mechanical root planing. However, with this new Honing Channel™ Sharpening System from Cutting Edge Technology LLC, hygienists and dentists are able to significantly reduce or eliminate wire edges, and create extremely fine, smooth, sharp, consistent cutting edges on their hand instruments. Ultimately, this finish on the cutting edges would be replicated on the root surface resulting in the smoothest possible root surface in line with the current definition of clinical root planing found in the 1996 World Workshops in Periodontology. Based upon the findings in the study by Nemcovsky et al. further research comparisons may demonstrate clinically significant biotherapeutic advantages over the other current forms of mechanical root debridement technologies in line with the objectives also listed in the 1996 World Workshops in Periodontics. In this study by Nemcovsky et al., the Honing Channel™ Sharpening System was reported to be easier to use and created finer cutting edges. This study is available for download as a PDF file (723 KB). Please use this link for downloading this file. Using the conical side of one of our patented sharpening stones to easily reshape and smooth the facial surface of the instrument from heel to toe. Now you can achieve perfectly sharp instruments in less time, and with less effort! Here we have an instrument being drawn through the patented honing channel, assuring that the shape will remain exactly the way it was before you began. The end result is a repeatable sharpening effort, and tools that are consistantly perfect every time! They are capable of cutting any metal and will not wear out! The aluminum oxide particles (man-made sapphires) are mixed with a special ceramic bonding agent and fired in sophisticated ovens for as long as three days at temperatures in excess of 3,000° F. The result is the creation of a sharpening stone which is made of the second hardest naturally occurring substance. Our concept of sharpening channels which selectively reshape and resharpen only the cutting edges of curettes brings in a new era for instrument sharpening. It now simplifies the entire sharpening procedure and permits non-licensed personnel to learn to sharpen all types of curettes in less than one hour of training. This includes the newer mini curettes with reduced blade length. This can realize a significant savings in professional time and money. Hygienists and dentists can now delegate the sharpening procedure to a technician or assistant and have instruments sharpened and ready for use ahead of time. Because the sharpening stones are fully autoclavable, each surgery, curettage, and root planing kit can have individual stones wrapped with full instrumentation. All of these are then sterilized together for the planned procedure. Well sharpened instruments benefit both the operator and the patient with less discomfort, less operator fatigue, and less chair time. and so easy to use anyone can be an Expert! ©1999-2013 C.E.T.L.L.C. All rights reserved.